Fatty acids are a class of compounds containing a long hydrocarbon chain and a terminal carboxylate group (-COOH). They have the general structure CH3(CH2)nCOOH. Fatty acids belong to a category of biological molecules called lipids, which are generally water-insoluble but highly soluble in organic solvents. Fatty acids function as fuel molecules and serve as components of many other classes of lipids, including triglycerides (commonly known as “fats”) and phospholipids, which are important building blocks of biological membranes. Fatty acid derivatives also function as hormones and intracellular messengers. Discipline is needed in maintaining proper nutrition relative to the intake of fatty acids. Dietary fats rich in saturated fatty acids, which are common in some dairy products (such as butter), meat, and poultry, correlate with heart disease, stroke, and even some cancers. High levels of saturated fats increase the amount of low-density lipoprotein (LDL), a transport molecule that carries fat and cholesterol from the liver, while lowering the amount of high-density lipoprotein (HDL), which clears cholesterol from the bloodstream. In contrast, foods with high percentages of monounsaturated and omega-3 and omega-6 fatty acids may work to prevent heart disease by lowering the LDL:HDL ratio. A diet with vegetable oils, fatty fish (such as salmon), and nuts is important in this respect. The term trans fatty acid refers to unsaturated fatty acids with a particular chemical configuration. Trans fatty acids are popular with manufacturers of processed foods because they are less vulnerable to rancidity and more solid at room temperature than cis fatty acids, which are more commonly found in nature. In essence, changing the chemical structure of the unsaturated fatty acids in plant oils helps manufacturers to simulate some of the properties of saturated fatty acids. However, trans fats reduce the fluidity (and functionality) of cell membranes. Trans fats have been associated with many health problems, but their biochemistry is poorly understood. Essential fatty acids are fatty acids that the human body cannot produce yet are essential for healthy functioning, and thus must be supplied by the diet. There are two such essential fatty acids, linoleic acid and alpha-linolenic acid, which can be obtained from plant and fish oils. Fatty acids are distinguished by two important characteristics: (1) chain length and (2) degree of unsaturation. 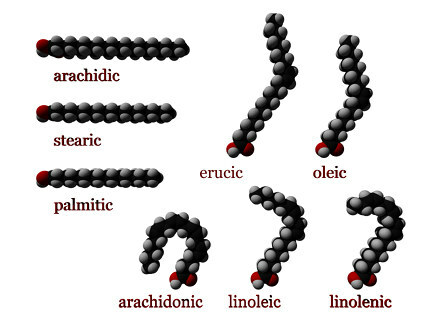 Fatty acid chains in naturally occurring triglycerides (fat) are typically unbranched and range from 14 to 24 carbon atoms, with 16- and 18-carbon lengths being the most common. Fatty acids found in plants and animals are usually composed of an even number of carbon atoms, because their biosynthesis in these organisms involves acetyl-CoA, a coenzyme carrying a two-carbon-atom group. Bacteria, however, possess the ability to synthesize odd- and branched-chain fatty acids. Consequently, ruminant animal fat, such as in cattle, contains significant proportions of branched-chain fatty acids, due to the action of bacteria in the rumen. Fatty acids may also differ in the number of hydrogen atoms that branch off of the chain of carbon atoms. When each carbon atom in the chain is bonded to two hydrogen atoms, the fatty acid is said to be saturated. Saturated fatty acids do not contain any double bonds between carbon atoms, because the carbon molecules are "saturated” with hydrogen; that is, they are bonded to the maximum number of hydrogen atoms. Saturated fatty acids form straight chains and, as a result, can be packed together very tightly, allowing living organisms to store chemical energy very densely. The double bonds in unsaturated fatty acids may occur either in a cis or trans isomer, depending on the geometry of the double bond. In the cis conformation, the hydrogens are on the same side of the double bond, whereas in the trans conformation, they are on the opposite side. A trans double bond between carbon atoms makes the molecule less 'kinked' in comparison to fatty acids with cis double bonds. Trans fatty acids are characteristically produced during industrial hydrogenation of plant oils. Research suggests that amounts of trans fats correlate with circulatory diseases such as atherosclerosis and coronary heart disease more than the same amount of non-trans fats, for reasons that are not well understood. The differences in geometry between the various types of unsaturated fatty acids, as well as between saturated and unsaturated fatty acids, play an important role in the construction of biological structures. For example, the presence of short and/or unsaturated fatty-acid chains in phospholipids and glycolipids generally enhances the fluidity of biological membranes, which are barriers that differentiate the cell from its environment, or define compartments within the cell (called organelles). At reduced temperatures, some organisms may vary the type and relative amounts of fatty acids to maintain the flexibility of their membranes. These changes in membrane lipid components contribute to the survival of plants, bacteria, and hibernating animals during winter. Fatty acids are also important components of another type of lipid, triglyceride (commonly known as fat), which consist of three fatty acid chains bonded to a glycerol backbone. A triglyceride is an ester of glycerol; i.e., a molecule formed from a condensation (water-releasing) reaction between the three hydroxyl (-OH) groups of glycerol and the carboxyl groups of the three fatty acid molecules. Triglycerides play an important role in metabolism as highly concentrated energy stores; when metabolized, they yield more than twice as much energy as carbohydrates and proteins (approximately 9 kcal/g versus 4 kcal/g). Some plant species, such as avocados, olives, and nuts, have substantial amounts of triglycerides in seeds or fruits that serve as energy reserves for the next generation. When they are not attached to other molecules, fatty acids are known as free fatty acids. Free fatty acids are an important source of fuel for many tissues since they can yield relatively large quantities of ATP, the chemical energy currency of the cell. Although many cell types can use either glucose or fatty acids for fuel, heart and skeletal muscle prefer fatty acids. On the other hand, the brain cannot use fatty acids as a source of fuel. During starvation or periods of low carbohydrate intake, the brain relies instead on glucose or on ketone bodies produced by the liver from fatty acid metabolism. The human body can produce all but two of the fatty acids it needs for healthy functioning. Since these two fatty acids cannot be synthesized and must be supplied in the diet, they are called essential fatty acids. The essential fatty acids for humans—linoleic acid and alpha-linolenic acid—are widely distributed in plant and fish oils. In the human body, essential fatty acids are primarily used to produce hormone-like substances that regulate a wide range of functions, including blood pressure, blood clotting, blood lipid levels, the immune response, and the inflammation response to injury infection. Naturally occurring fats contain varying proportions of saturated and unsaturated fatty acids, which in turn determine their relative energy content and melting point. The following table provides the fatty acid and cholesterol composition of some common dietary fats (Food Standards Agency 1991, Altar 2006). In IUPAC nomenclature, the name of a fatty acid is derived from its parent hydrocarbon by substituting the suffix -oic for the final -e. (In common nomenclature, the suffix is usually -ic.) For example, octodecanoic acid (stearic acid) is so called because its parent hydrocarbon is octadecane. An 18-carbon fatty acid with one double bond is called octadecenoic acid; one with two double bonds is octadecadienoic acid. The notation C18:0 signifies that the fatty acid chain consists of 18 carbon atoms and does not contain any double bonds, whereas the notation C18:1 describes an 18-carbon chain with one double bond. cis/trans-Delta-x or cis/trans-Δx: The superscript indicates that the double bond is located on the xth carbon-carbon bond, counting from the carboxyl end. The cis or trans notation indicates whether the molecule is arranged in a cis or trans conformation. In the case of a molecule having more than one double bond, the notation is, for example, cis,cis-Δ9,Δ12. Omega-x or ω-x : Alternatively, the position of a double bond can be counted starting from the distal end, with the ω carbon (methyl carbon) as position one. Sometimes, the symbol ω is substituted by a lowercase letter n, making the notation n-6 or n-3. Altar, T. 2006. More than you wanted to know about fats/oils. Sundance Natural Foods Online. Retrieved August 31, 2006. Food Standards Agency. 1991. McCance & Widdowson's The Composition of Foods. Royal Society of Chemistry. Purves, W., D. Sadava, G. Orians and H. C. Heller. 2004. Life: The Science of Biology, 7th edition. Sunderland, MA: Sinauer. Fat content and fatty acid composition of seed oils from Udo Erasmus' book, Fats that Heal, Fats that Kill. This page was last modified on 26 March 2017, at 23:36.